Best Mobility Scooters Online & On the Go! Your Online Mobility Scooter Advisors! 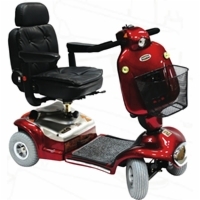 Regardless of your electric scooter mobility needs, whether you’re searching for electric medical scooters for adults, an inside scooter for around the home or work place; 4 wheeled scooters for handicapped maneuverability, heavy duty mobility scooters for disabled individuals, portable mobility scooters or lightweight foldable scooters for short trips or vacations, we have an extensive selection of battery powered mobility scooters for all your electric scooter mobility needs. 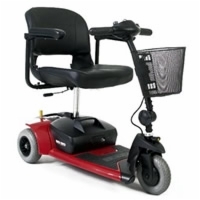 Click Here to get your "Free Mobility Scooters Buyers Guide"
Battery powered scooters for adults are ideal mobile solutions for individuals with limited mobility. For years electric medical scooters have been providing mobility aid and assistance to people recovering from surgery and accidents, short term and long term illnesses, as well as providing scooter mobility options for age related or other mobility limiting conditions such as COPD, emphysema, chronic bronchitis or asthma, and for those with decreased physical strength or stamina who are simply unable to manage slopes or walk for any distance. Three wheel medical scooters provide a tighter turning radius for better manueverability indoors. 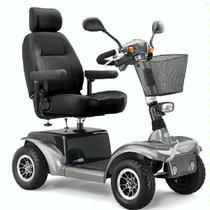 Higher speeds, longer battery life and larger tires allows outdoor functionality over relatively smooth surfaces. Three wheeled scooters can normally be disassembled and carried easily inside a vehicle for trips to doctors offices, grocery store, drug store and for other outings. A four wheel scooter is a perfect fit if portability and turning radius is not an issue. Because of the added stability of 4 wheels and an extended battery life 4 wheel scooters will provide a better outdoor experience than other mobility scooter types and are also frequently used as medical scooters for persons with limited mobility. Scooters are classified as heavy duty mobility & medical scooters based on there weight supporting capabilities and are typically purchased by individuals weighing 300 pounds or more. 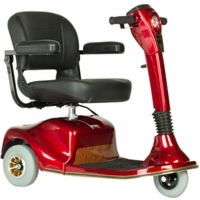 With reinforced frames, front and/or back anti tip wheels and sturdy construction they are ideal as an inside scooter & for outdoor use. Travel scooters are lightweight scooters that are often purchased as an inside scooter or as medical scooters due to there compact frames and tight space maneuverability. Three wheel travel scooters and 4 wheel travel scooters typically disassemble into 3 or more easy-to-manage components which can be transported in the trunk of most cars. Lightweight travel scooters are ideal for the on-the-go lifestyle. A lightweight folding mobility scooter is just what the name implies, rather than disassemble, once the battery pack is removed, it will simple fold up and can be carried much like a suitcase and will weigh roughly 50 lbs more or less. Since a foldable scooter is not built for rough terrain many people will purchase a folding scooter for their ease of transport for quick trips around town and for other uses where a full size medical scooter is not needed. 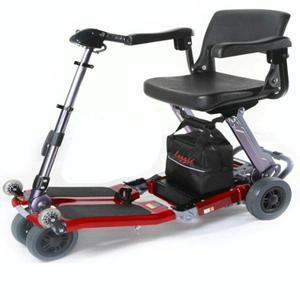 In addition to an electric folding scooter for adults, many users will also purchase a full-size medical scooter for all their other scooter mobility needs. 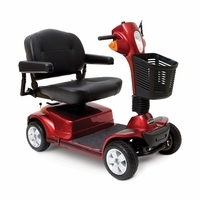 Note: Although there are many mobility scooters that disassemble the heaviest part can still be more than many people can manage on their own. When stowing the parts in a vehicle you may need the assistance of another person or some other mobility devices to aid in transporting your mobility scooter or medical scooter.